Back pain is a common problem and affects almost everyone at some point in their life. Though you may be able to manage your back pain at home, if your back pain is persistent and keeps you from enjoying your life, Dr. Spohn at Cedar Plains Family Medicine in Hickman, Nebraska can provide treatment to help you feel better and get back to your life. Call today, or schedule an appointment online. Where does back pain occur? Back pain can occur on any part of your back, from upper to lower. Upper to middle back pain is any pain that occurs from the bottom of your neck to the bottom of your rib cage. Pain in this area of your back is less common than neck or low back pain because the bones are less flexible and less prone to injury. Eight out of every 10 adults experiences low back pain at some point in their life, which is pain located from the bottom of your rib cage to the top of your buttocks. It’s a common reason for missed days at work and the leading cause of job-related disability. Knowing the cause of your back pain may help Dr. Spohn direct treatment. In some cases, such as a herniated disc or degeneration, you may not know the cause. An X-ray, MRI, or CT scan may be needed to assist in diagnosing the cause of your pain. Although the cause of back pain varies, symptoms tend to be similar, which can make finding the specific cause your pain difficult. 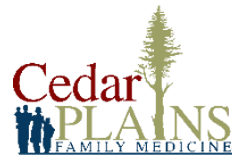 You should call Cedar Plains Family Medicine for an examination if you’re experiencing numbness or tingling in your groin or extremities, pain goes down your leg, or the pain gets worse after you cough. Treatment for back pain varies, but starts with conservative measures, such as rest, ice, and heat. If your back pain persists, Dr. Spohn may recommend exercises to strengthen your muscles or refer you to physical therapy. To reduce pain and inflammation, over-the-counter medication may be recommended. Prescription medication, such as antiseizure or antidepressants, may also be used. For medical management of low back pain, call Cedar Plains Family Medicine, or schedule an appointment online.